In a perfect world, the sun would always shine when you headed out to the first tee. Of course, this is not a perfect world, and you are sure to play your fair share of golf in ‘less-than-ideal’ conditions as the years go by. A golfer who is unwilling to play in the rain is a golfer who will miss out on many opportunities to hit the links – so you don’t want to put yourself in that category. While playing in the rain might not be quite as fun as playing on a beautiful day, you can still have a great time on the course as long as you have the right gear. Speaking of gear, a golf umbrella is one of those basic pieces of equipment that all golfers should have in the bag. Whether you live in a place where rain is rare, or you live in a damp part of the world, you always want to be prepared for a shower. Most golf bags include a slot specifically meant to hold a golf umbrella, so you should be able to store yours away with no trouble at all. When the rain does come in, you can simply pull out the umbrella, put it up, and go on with your business. While it might technically be possible to play golf in the rain without an umbrella, you really don’t want to find yourself in that position. An umbrella is not only going to help keep your body dry, but it is also going to be able to protect your gear as well. Wet golf clubs, and specifically, wet grips, make this game nearly impossible to play. Using a good golf umbrella will make the day more enjoyable, and you will have a much better chance of playing your best. When you decide to purchase a new golf umbrella to add to your equipment, what should you be looking for exactly? First, you need to find a quality product. It might be tempting to pick up a cheap umbrella for just a few dollars, but those kinds of models will only do you more harm than good. Even a quality golf umbrella is going to be relatively affordable, and you should have a product that is going to stand the test of time. Why Are Windproof Umbrellas Important? Aside from quality, another feature you should look for is a windproof design. Windproof umbrellas have vents or slats in the umbrella that allow wind to pass through on a blustery day. This is important if you wish to avoid the dreaded inside-out umbrella situation. You may have previously seen someone on the course chasing an inside-out umbrella down the fairway on a wet and windy day – and you don’t want that to be you. 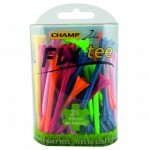 If you think you will be playing some golf in breezy conditions, be sure to select a windproof design. In terms of size, you don’t necessarily have to purchase the biggest umbrella on the market for it to work effectively. If you are a smaller person, a smaller model should be just fine. However, if you are a bigger person, or if you want to be able to keep other people dry as well, a large model will be the right choice. To help you find the perfect golf umbrella for your needs, we have listed four of the top options below. Happy shopping and stay dry out there! GustBuster is one of the top names in the golf umbrella market, so it only makes sense that we start our list with one of their best models. The Pro Series 62-Inch Golf Umbrella is 100% nylon, it uses a double-canopy design to deal with the wind, and it features a fiberglass frame. 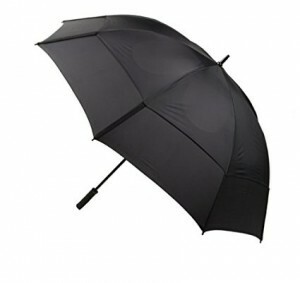 This umbrella is a great example of investing in quality to receive a long-lasting item. Often priced between $40 – $50, this is an umbrella that delivers plenty of performance and durability for your money. For a more affordable option, we move on to a model from RainStoppers. 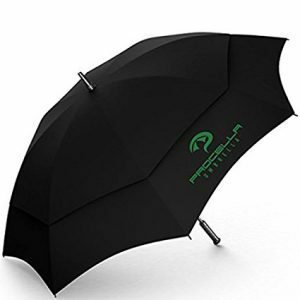 Usually sold for around $20, this umbrella is great for those on a budget, although it does not offer some of the features of an advanced model like the GustBuster. This is a large umbrella, however, at 68-inches. Rather than allowing wind to pass through a double-canopy design, this umbrella deals with wind simply by flipping inside-out without breaking. 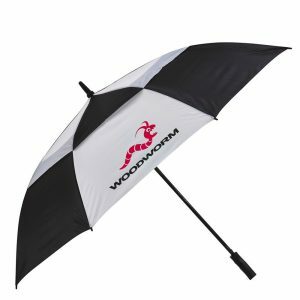 For a standard, classic golf umbrella without any bells and whistles, give consideration to this option from RainStoppers. 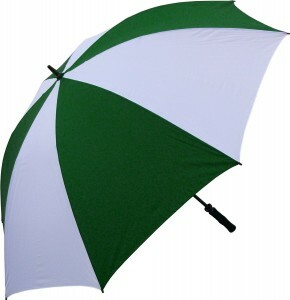 Another option with a double-canopy design, this one comes from Procella Umbrella. The price of this unit is similar to the GustBusters model that started our list, and it is the same 62-inch size as well. In fact, there are a lot of similarities between those two options, so you will want to check each of them out for yourself to determine which is your favorite. 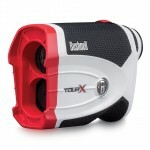 A variety of colors is available in this well-rated model, meaning it should be easy to pick out one that matches with the rest of your golf gear.